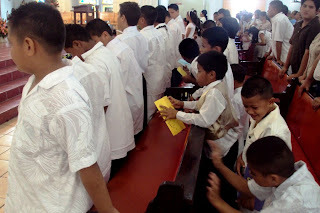 As far as I can tell, White Sunday is unique to Samoa, although blog readers from New Zealand and Australia can clue me in if I’m wrong. Even among Samoans there seems to be confusion about who celebrates White Sunday or Le Aso Sā Pa’epa’e or Loto Tamaiti. I got a ride from a Congregationalist Reverend to the Catholic Church in Mulivae for a White Sunday rehearsal, and as I was getting out of the car he said, “I didn’t know Catholics celebrated White Sunday.” Neither did I.
Jordan says he’d heard of it before he came here. PCT Kyle was wondering if Rome celebrated it. I’ve also heard it originated with the Methodists. So who knows, really? Here are some facts I do know: In Samoa, White Sunday is celebrated the second Sunday in October. 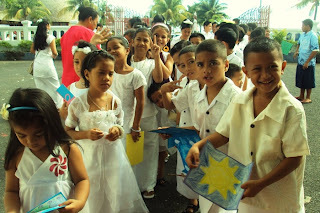 On White Sunday, it is traditional for children to wear formal white (duh) clothes. At church, they sing, dance, occasionally act, and recite bible verses for the congregation. After church services, they go home and eat the biggest to’ona’i of the year and many children are given ice cream and gifts. It seems like Mother’s Day for children with some Christmas and Easter children’s choir thrown in for good measure. I’m told it’s a bigger deal than Christmas. That last one might be a lie in the sense Christmas is hugely anticipated here. 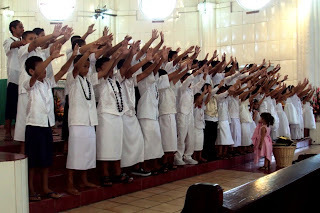 From what I remember from last year, White Sunday in Samoa is the equivalent of Thanksgiving in The States; that is, it’s effectively a starting pistol for the Christmas season. Christmas Day itself was relatively low-key and anticlimactic though, whereas White Sunday is a big day full of celebration and activity. It’s a big enough day my school gets Friday AND Monday off in order to ensure students have time to get home for the weekend and return back to school after. I bolted after mass this morning, so I didn’t get to revel in the ice cream and celebration, but mass was a pretty big deal and try as I might to resist, I got into the spirit. Since I was helping coordinate, I was appointed at the last minute to sit in the boys’ pew during mass to keep them as well-behaved as possible and to cue the ones who had active roles in the mass. This job is just the sort of cat-wrangling you might expect. I herded the boys into the pews, I kept 5-year-old Raphael in check every time he tried to swat the kid next to him with a songbook, I hurriedly got the intercessions boys up on the altar when the priest decided to skip the creed. Also as one might expect, there were a bunch of kids there today who’d never shown up to rehearsal. I didn’t mind at all, but it became a slight problem when one such 4-year-old got up for the dance and song portion, and then changed his mind and came and sat down in the pew by himself. He was decked out in a red bow tie, and while I had no problem with him chilling with me in the pew, I figured his parents would probably want to see him up there. I gave him a nudge. And that was all it took. He sprang right back up there. The kids were cute and awkward, and it was moving when they dedicated the event to the children who died in the tsunami. But I still haven’t figured out if it’s a Kiwi thing or what. I hope you had great White Sunday. Pictures below. Kids getting art projects ready to present. 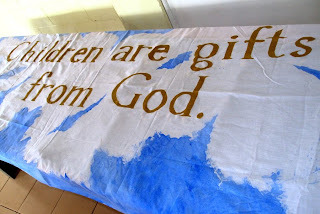 Banner created for the day. In the pew with the boys. The big song and dance number. I didn't notice the girl standing in front until just now. Hilarious. White Sunday (as far as I know) is a Samoan tradition but I'm not sure which denomination started it. It is celebrated in NZ and around the world by EFKS, Samoan Methodist and Samoan Catholic congregations although outside Samoa, it's more symbolic than anything. For me, it's the only Sunday I go to church. Tongan Methodist in NZ have also adopted the White Sunday concept. EFKS, Methodist and Catholic congregations have their White Sunday on the second Sunday in October while the Pacific Island Presbyterian congregations have theirs on the last Sunday to coincide with a long weekend in NZ. Not sure when Tongans have theirs. NZ recently designated a day in March as Children's Day but this is not a public holiday. Again, I think the idea was from the White Sunday concept. White Sunday originated in the EFKS church just over one hundred years ago. It was a tradition started by the missionaries to celebrate children and the role they play in the church, after all, Jesus said: Let the children come. Samoans all over the world still commemorate this special day and almost all Christian congregations across Australia and New Zealand, the United States and wherever there are Samoans in the world celebrated this day, as they do every year. Manuia le Aso... and keep up the good work. Great post! It brought back memories of my OLG days. It sounds like a very fun celebration! The photo with the little girl in front is so funny...loved your caption. I am a teacher in NZ and our school wide theme is Food Glorious Food. As part of this topic we are learning a bit about White Sunday. I found your blog through google. Great post. All Christian faiths should celebrate White Sunday, the theme is to celebrate Children. So there is Mother's Day, Father's Day & White Sunday. The children are given a special mass, where they re-enact bible stories or recite biblical texts and families give them leis or money. Then they go home or to the Community Hall and are lavished with food and treats and it's the only Sunday that kids are treated honourably (they don't wait for the elders to be served first). Usually it's Sunday School Teachers who ready and que the kids. I agree with one comment....in yonder years Catholics had First Communion and the Protestant churches had White Sunday. 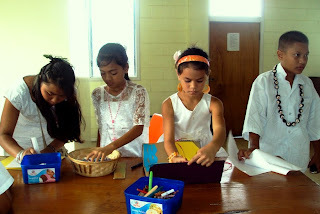 white Sunday...a great Samoan tradition!! My Mum has fond memories of it. The "Mormons" don't celebrate white Sunday but do have a yearly children's presentation where the children present what they have learned all year. They take over the main meeting with songs and scriptures and it's always fun to see what the kids say and do!! White Sunday is a good way for little kids to learn public speaking. I always used to dread saying my tauloto every year because of the huge crowd. But I look back on it as a great learning curve. Talofa, this read is very interesting as I too am quite interested to actually find out where this all started. I am a Samoan, born and christened in the Samoan Methodist faith which resides in Faleula. My parents were servants of the cloth within this Ekalesia so we moved around a lot within NZ and earlier in Samoa. As far back as I am able to remember, White Sunday was a 'Methodist Thing' but since emigerating to NZ in the early 6os, other denominations have since practices this rite - ritual. History documents this day to have origin with the Pentacost and celebrations of this day was traditionally around Easter. Roman and Greek Orthodox followings document this as 'Whit Sunday of which celebrations were carried out by children - those of pure heart and soul-. Traditionally in Samoa, this has been a day that the roles and responsibilities of the adult are reversed and children are seen as 'gifts to be treasured by all. Children are treated with the upmost respect (this also occurs daily); adults serve with love and respect as this is the epitome of the 'Samoan Heart' as documented by many researchers of late. It would be interesting to see what others think of this special day and also to see if others know of the 'ground history' - where this all stemmed from. True to the tale, the missionaries introduced this ritual. Where there any other information of the time that is known??? There are conflicting beliefs as to the origin of White Sunday. But I'm sure of one thing, growing up in my village, only the EFKS celebrated it. The other denominations would all flog into our EFKS church to watch the plays and taulotos on this day. It has been recorded that the London Missionaries started this in 1920 after the influenza epidemic which killed almost quarter of the Samoan population in 1918-1919, most of them children. All the EFKS churches I have attended, Samoa, NZ and Aust, this is the day where the children perform for their parents, under the guidance of their Sunday school teachers. This is also the day where families pay their respect to a loved one who passed on during that year. Meaning only the families of those who passed during that year will perform a play, tauloto etc outside of the Sunday school program. All the EFKS I have attended follow that tradition which makes sense. Imagine if all the congregation families want to do taulotos and plays on this day, it will probably take 2 days as the EFKSs I have attended are very large in numbers. For the families who have lost a loved one during that year to perform on the day, there is always a lot of emotions and mostly, you wouldn't find a dry eye in the church when these families take the floor. I think this coincides with the belief White Sunday started in 1920 by the London Missionaries after the influenza epidemic to celebrate childhood (given most who died were children) and for us to pay respect to our loved ones we loose along the way. Our EFKS in Samoa still maintain that tradition, the only times our family performed was when we paid tribute to my father when he passed in 1993, my sister in 2009 and an uncle who passed away this year.